Coming soon: autonomous road rage. While being tested in California on Valentine’s Day, one of Google’s self-driving cars clipped a public bus in what may be the first fender bender that was the fault of an autonomous vehicle. 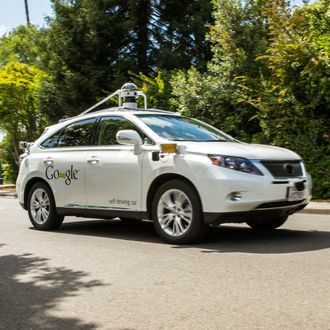 Google’s automated Lexus SUV was swerving out of the way of some sandbags in the street in Mountain View, California, when its left front bumper hit the right side of the bus. It was doing all of two miles per hour at the time; the bus was doing about 15. Nobody got hurt. The accident report does not specify who was at fault, reports the Associated Press. These test cars are required to have a driver at the wheel, ready to take over in an emergency. Google said in a statement on Monday: “We clearly bear some responsibility, because if our car hadn’t moved, there wouldn’t have been a collision. That said, our test driver believed the bus was going to slow or stop to allow us to merge into the traffic, and that there would be sufficient space to do that.” The company says it’s reviewing the accident and teaching its cars (!) about the possibility of unyielding buses. In November, Google said that its autonomous cars have been involved in 17 minor accidents over more than 2 million miles of tests. Mostly, the cars were hit from behind, and the company has said that none of the other incidents were the cars’ fault. Google has frequently pointed out that, of the thousands of minor accidents that occur each year, 94 percent result from human error.